The Alaskan Malamute is a working dog which had been bred to perform specific dog sledding tasks. It is hard to pinpoint exactly when the breed began. However, upon Russia’s discovery of Alaska in 1741, tales of the “Alaskan Arctic Sledge Dogs” arose. Mushing (dog sledding) was and sometimes still is a necessary method of transportation in the arctic circle and frozen tundras of the world’s northern landscapes. Without roads, vehicles, access to gasoline, and intense ever-changing weather, sled dogs were the only opportunity for Alaskans to provide transport, gather resources (food and supplies), trade, haul heavy freight, and network with other Alaskans. The native Innuit, Mahlemut tribe (now Malamutes) of Alaska, were the first peoples to be seen “using dogs to haul sledges.” Their dogs were described as affectionate, beautiful, fine, powerful looking, enduring and tireless by the white people who came across them. The Alaskan Malamute became recognized as its own breed in 1935. Many dog sled racing records are held by Malamutes as opposed to similar breeds such as the Siberian Husky, Samoyed and Eskimo dog who would engage in racing tournaments as well. 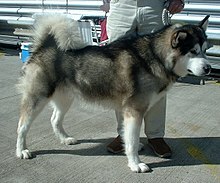 The Malamute is typically wolfish grey with black or white, with white being seen on the underbelly, legs, feet, face and sometimes forehead. Although rare, an all white Malamute can be seen as well. Malamutes are considerably denser than other sled dog breeds. Their coats are often heavier, and bodies are more hefty and heavier. They are deep-chested and have a smooth gait, with a large, fluffy curled tail. Their average height is around 23- 25 inches and can weigh between 75 to 85 lbs. Malamutes typically have brown eyes and are not to be confused with their blue-eyed cousin the Husky. Their dense, heavy coats make them unsuitable for warm climates, and require a lot of up-keep since they will produce a tremendous amount of hair when shedding. 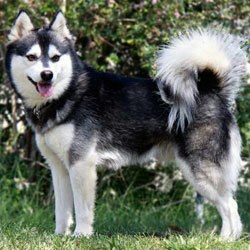 Overall, the Malamute is a highly intelligent, friendly and affectionate breed that is well-suited for colder climates. Due to their breed origin, they may require a moderate to high level of activity and exercise.